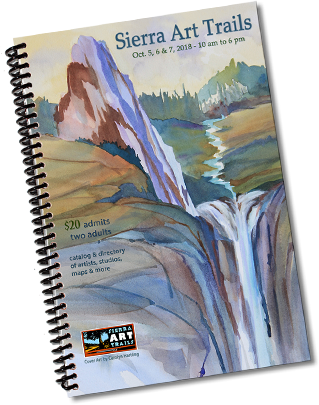 Cost of admission is $20.00 for all participating venues, and includes the Sierra Art Trails Catalog, your “ticket for two” for the event. The catalog includes a list of participating artists, examples of their work, and maps to the locations of artists’ studios, galleries, and other viewing locations. Artists are scattered throughout the area. Your catalog and map will guide you. CLICK HERE to order your catalog! Catalogs ordered after 9/22/19 must be picked up at Stellar Gallery in Oakhurst. View corrections, last minute changes, and announcements for the Art Trails weekend. Visitors plan their own agenda, tour the area, and visit the artists’ viewing locations during the prescribed hours of the show, 10AM to 6 PM, Friday October 4th through Sunday, October 6th, 2019. Some artists do not show on Friday, as indicated in your Art Trails catalog. Review your catalog to help you select the artists you would like to meet, note their studio numbers, and then locate the artists on the enclosed maps. To help you along the way, numbered signs are placed throughout the area to help guide you the to the show sites. Once you’ve decided which artists to visit, you are ready to hit the road and enjoy a fabulous weekend exploring our foothill communities. Studios are as unique as the artists themselves. You may decide to go off the route you have laid out, that’s okay, it’s your adventure! Visitors are also encouraged to visit the Preview Exhibit at Stellar Gallery in Oakhurst, where they can view representative works by every artist in the show, and plan their routes for the weekend. We hope you have a great time. Please share how much you enjoy Sierra Art Trails Open Studio Tour with others and with us. Although Sierra Art Trails is only once a year most artists are available by appointment year-round. Keep your catalog or share it with your friends after the event! It contains valuable information on the artists, and can be used for reference year round.